Each week, millions of viewers tune into The Discovery Channel to watch their favorite dysfunctional American family, the Teutuls. The hit TV show American Chopper features Paul Teutul, Sr., and his sons Paul, Jr. and Mikey, along with a supporting cast of mechanics and friends. Together, they create some of the most incredible and outrageous motorcycles in the world. 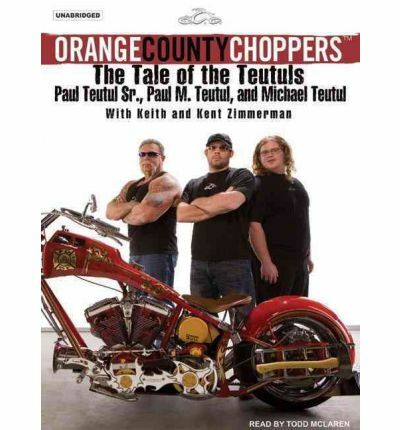 Now, in Orange County Choppers, the Teutuls combine family history with a behind-the-scenes tour of their renowned motorcycle shop-and their new lives as household names. Hilarious and heartwarming, fans of the show and newcomers alike will delight in this truly authentic America success story. About the Author: Todd McLaren was involved in radio for more than twenty years in cities on both coasts, including Philadelphia, San Francisco, and Los Angeles. He left broadcasting for a full-time career in voice-overs, where he has been heard on more than 5,000 TV and radio commercials, as well as TV promos; narrations for documentaries on such networks as A&E, Discovery, and the History Channel; and films, including Who Framed Roger Rabbit?